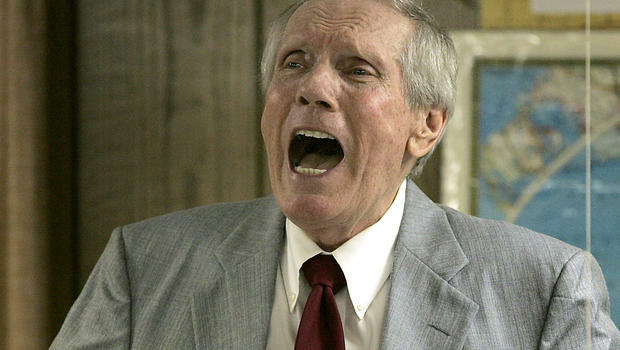 CHICAGO — Truth Wins Out today noted the death of notorious hate group leader Fred Phelps, former head of the Westboro Baptist Church based in Topeka, Kansas. Phelps and his family were famously reviled for protesting gay pride parades, soldiers’ funerals, concerts and any other events where they could spread their vitriol. Fred Phelps was shunned by many on the Religious Right, and even accused of being a pro-gay plant designed to make them look bad, because he delivered the message of the Religious Right without euphemisms. Fred Phelps’ slogan continues to be the primary message of groups like the American Family Association, Family Research Council and lesser entities like Americans For Truth and Mission America, distilled into its simplest form. Indeed, Phelps’ fundamental honesty exposed the true face of anti-gay hatred in America. In 2011, the Phelps family won a case, Snyder v. Phelps, in the United States Supreme Court. The family of a fallen soldier whose funeral the family protested sued Phelps and two of his daughters for “defamation, intrusion upon seclusion, publicity given to private life, intentional infliction of emotional distress and civil conspiracy.” Though damages were awarded to the Snyders by lower courts, the Supreme Court ultimately found that the Phelps’ protests were covered under the First Amendment, a ruling that, though the subject matter was grotesque, educated many about the strength of First Amendment protections in the United States. Toward the end of his life, Fred Phelps was excommunicated from the church he founded. The family has stated that the church will continue on, though Phelps won’t be around to see his life’s work fully undone before his eyes. Truth Wins Out believes that, rather than emulating the behavior of Fred and his clan over the years, the LGBT community would be best served to mark his passing as the end of an era and let him go in peace while we redouble our efforts to continue the fight for equality at home and for our LGBT brothers and sisters abroad, millions of whom live in places that become harsher and more dangerous for them every year.